The goal of the Georgia Transition Plan is to ensure a smooth transitioning to full domestic funding of its HIV and TB programs by 2022 without compromising services. However, the plan does not specify which services the government is taking over or when. The Global Fund has announced how it plans to allocate the $260 million in the 2017-2019 allocations set aside for multi-country approaches. The Fund has identified the strategic priority areas and will use a combination of pre-identified applicants and competitive applications to develop one or more initiatives in each area. The Office of the Inspector General has rated the Global Fund’s grants to the Republic of South Africa as in need of significant improvement. According to the July 2017 audit, implementation has at times varied from the original concept note, experienced delays, and been hampered by coordination challenges. The country coordinating mechanism and the Global Fund Secretariat have agreed on a number of actions to mitigate risk and accelerate results going forward. An audit by the Office of the Inspector General into the planning and management of consultants finds that the Global Fund is making good progress, particularly in the last year and half. The use of consultants, as a percentage of total staff costs, has been reduced from 35% in 2015 to 19% in 2016. Global Fund Observer offers a focused profile of Unitaid, an organization that has deep synergies with the Global Fund. There are good reasons for Global Fund stakeholders – particularly those involved with funding request development and implementation planning – to be aware of how Unitaid works and what that can mean for HIV, TB and malaria programs at country level. The Global Fund continues to show impressive gains with respect to the number of people receiving key services as a result of programs supported by the Fund. Some of the gains reflect increased uptake of services, while others are the result of better reporting. A thematic review of fraud reporting by four international NGOs conducted by the Office of the Inspector General has concluded that all four have strong anti-fraud policies and procedures in place. The OIG said that there were only a few examples of under-reporting, which have since been rectified through the implementation of improved procedures. This article provides short summaries of recent announcements regarding HIV. The Secretariat has made progress in improving consultant management processes, particularly over the last year and half. Consultant costs, as a percentage of total staff costs, have gone down from 35% in 2015 to 19% in 2016. Processes and compliance have improved. The Secretariat is aware of several outstanding weaknesses and has various ongoing initiatives to remediate them. These were among the findings of an audit on the planning and management of consultants conducted by the Office of the Inspector General (OIG). A report on the audit was released on 2 August 2017. In 2016, the OIG said, the Secretariat initiated consultant procurement planning and zero-based budgeting. 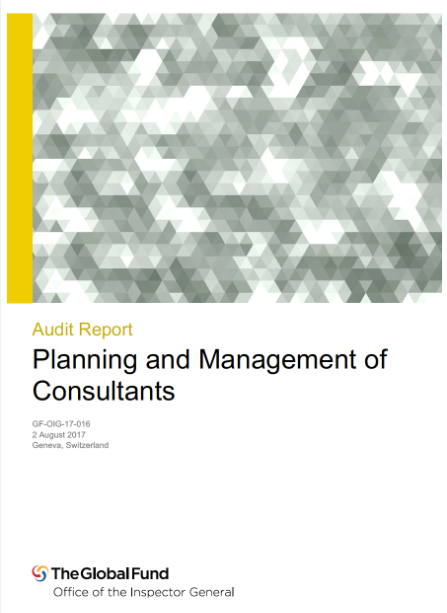 The first annual consultants’ procurement plan was completed in 2017. However, the OIG noted that the Global Fund has not yet developed robust strategic workforce planning processes; and that the pros and cons of engaging employees as opposed to long-term consultants are generally not analyzed. Currently, about 60% of the individual consultants are contracted for a period of more than one year. In some cases, the OIG said, long-term consultants were used after staff positions were denied due to an upper limit on staff costs. The consultant planning and management cycle involves different units of the Secretariat, such as human resource management, budgeting and legal. The processes and controls for consultant management vary considerably across these units. The OIG said that a lack of clearly defined roles and accountability has limited the effectiveness of controls related to consultant management. It added that there is a need for increased institutional guidance and standardized controls. The financial system used for managing consultant expenditures has strong controls, the OIG reported. However, this system is not designed to cover additional management information needs, which are therefore being addressed through manual processes. On the human resources side, the OIG said, a system is not yet in place to provide easy and reliable access to key information on consultants for effective strategic planning and operational decision-making. The OIG noted that software improvements are currently being designed which will address these gaps. With respect to contracting and performance management of consultants, the OIG stated that ongoing initiatives have led to adequate on-boarding guidance for consultants, improved integrity checks, and generally well-defined scope of work. However, the OIG said, improvements are needed in the areas of compliance with contractual requirements, reference checks of consultants, and tracking and recording of performance. In summary, the table below lists the four aspects of consultant management examined by the OIG in this audit, and the OIG’s rating for each one. In response to the OIG’s findings, the Secretariat agreed to incorporate detailed guidance to its various units on the use of consultants; to define roles and responsibilities for key aspects of consultant management; and to enhance controls on contractual compliance, reference checking and performance tracking. The Secretariat will also analyze the costs, benefits and risks for existing long-term consultants against staffing options. The OIG audit report on the Global Fund Procurement and Supply Chain Management in 2015 (GF-OIG-15-008) covered the recruitment and selection of consultants. Significant gaps were identified; for example, 74% of non-health procurements sampled, including consultants, were selected using the “exception to competition” option. The audit also confirmed earlier findings from a European Commission audit of the Global Fund, about material weaknesses in procurement-related systems, controls, rules and procedures. Subsequent OIG reports (GF-OIG-16-016 and GF-OIG-16-026) covering consultant selection highlighted similar weaknesses. Other selection weaknesses were also noted, including missing critical bid evaluation details in the bidding documents; arbitrary use of different evaluation methods in selection which were not pre-defined; failure to prepare technical evaluation reports; evaluation committee members not declaring potential conflicts of interest; and non-competitive determination of consulting fee rates. In response to these various findings on the selection processes, the Secretariat is currently revising all procurement regulations under an ongoing Procurement Improvement Plan, a joint initiative of the finance and sourcing teams. This plan is incorporating strengthened controls in the consultant selection processes, including stricter rules on the use of “exceptions to competition,” approval thresholds, and conflict of interest declarations. The improvements also include clear definitions of compliance roles, accountabilities and reporting mechanisms. The revisions are captured in the agreed management actions from the earlier OIG reports, with target dates of June 2017. All OIG reports are available on the audit and investigations page of the OIG section of the Global Fund’s website.